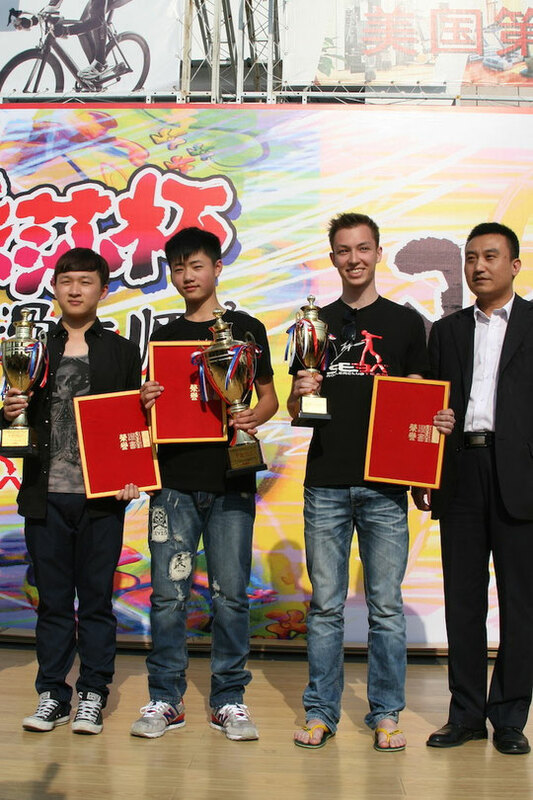 The Freestyle Slalom Masters 2014 took place on April 30th, in Beijing, China. This time the best riders of the world were selected to compete on Freestyle Classic and not in Battle as the previous three years. As usual the registration for this event was by invitation only. The strongests riders from China, South Korea, France, Poland, Russia, Ukraine and Japan came to present their vision of freestyle slalom and perform their best to win. Like always the level of this competition was very high, so that was not so easy to get the victory. For the first time of this competition, an European rider managed to climb to the first step of the podium - Daria Kuznetsova from Russia took the first place leaving behind her two chinese riders. Regular participant of this competition Feng Hui took the second place and newcomer for this event Zhao Yi Ran took the third place. In the men’s category, the winner of the last year's Battle Masters, Chinese rider Zhang Hao, took the first place at the Freestyle Slalom Masters as well. It is obviously a great achievement to win Battle Masters and Classic masters in a row, in one of the hardest competition of the year. Guo Fang, who showed a very artistic performance, took the second place. A newcomer in this invitational event, Alexander Timchenko from Russia took the third place, thanks to his clear and dynamic run. It was a very good result for someone who participated for the first time at such a high level event. Q. Did you like your performance and are you satisfied with the result? A. I liked my performance but I made a few mistakes, I thought I could do it better but i did not train enough on that slippery floor and some tricks were missed. Q. What do you think about other skaters’ performances? A. Other skaters had very impressive dynamic runs with high technical level. There were a lot of interesting dancing movements, especially from the asian skaters. Almost everyone had some problems with the floor. It was really slippery so unfortunately riders made some mistakes. Q. On Which competitions will you take part this year? A. I will come to Paris Slalom World Cup, Russian National Championship, European and World Championships and maybe some other international events. Q. This is your first time at the Masters event. How did you find it? A. That was my first time for this kind of competition and also first time in Beijing! It was a great event! I tried not to be nervous and show the best results despite the slippery floor and hot weather. Q. Did you like your performance and are you happy with your result? A. I tried to enjoy my skating so I am very happy with my performance and result. Q. What do you think about others performances? A. Asian skaters showed their amazing footwork and style as usual, but European's level on classics grew up in style and technic as well. Q. On Which competitions you will take part this year? A. I would like to visit European and World Championships. I also hope to come to Shanghai, and some other events.